A Kickstarter campaign for a device that blows wind on your face to give you a more immersive VR experience has achieved it’s complete funding goal within a few hours of launch. Reminiscent of 4D cinema experiences that blow wind in your face to give you a more immersive 3D experience, the ZephVR straps to your VR headset and blows wind on your face in moments where you’d have a windy face in the game. Feel the wind blowing through your...teeth? The ZephVR can work with industry-leading VR headsets HTC Vive and Oculus Rift, as well as the hugely popular PSVR headset. At time of writing there are still 30 days of the Kickstarter campaign left, so even though its goal has been met, it’s a good chance for you to pre-order a ZephVR if you want to enhance your VR experience. And, given that the campaign is so fresh, there are still ‘early bird’ discounts for both the Valve/Rift version and the PSVR version. And all jokes aside, it does look like the ZephVR would enhance the VR experience. By using an algorithm (shown in the video below), the device can determine moments where you would normally feel the effect of your world moving around you, like sudden acceleration in a vehicle or something flying past your face. You can see the code on the left turn from red (no wind) to green (windy) at the appropriate moments. 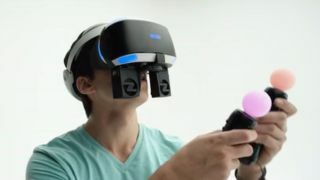 While it's easy to poke fun at, we do think it'd be fun to try one, and see if it does improve the VR experience.